Meet talented youngster Robert Lambert, the new kid on the block in one of Britain's most dangerous and exhilarating sports, where speeds of 60 miles per hour are reached in three seconds and the bikes have no brakes. 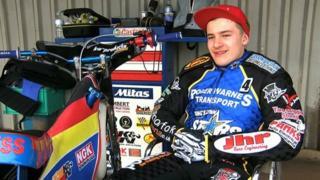 The 16-year-old will ride alongside some of the world's best talent for Kings Lynn Stars this season - and wants to become the best speedway rider of them all. BBC Look East sports correspondent Phil Daley reports. If you are interested in getting involved in speedway, explore our for more information.